PORT Adelaide has stunned the reigning premiers Hawthorn at the MCG, dismantling their vaunted zone and running away with a 30-point victory. The Power’s 17.13 (115) to 12.13 (85) win was built around a concerted plan to pluck holes in the Hawks’ zone and exploit their height advantage in attack. Warren Tredrea was the key to the latter part of the plan with six goals at full forward. The Hawks started the match with ruckman Brent Renouf as Tredrea’s opponent and unsuccessfully tried a number of other opponents during the day. At the other end of the field, Jarryd Roughead was smashed by Troy Chaplin and Alipate Carlile stuck manfully at his task against Buddy Franklin. But more than anything the win was built on resilience. The Power held only a slender lead for most of the day and there was always an expectation that Hawthorn’s big guns would fire up and take charge. The scores were level at the final change however when push came to shove it was Port Adelaide that held its nerve. Even an inaccurate return from star forward Daniel Motlop, who kicked 0.5, couldn’t dampen the mood. The win propels the Power to a 3-1 record but leaves the Hawks sitting in dangerous territory at 1-3 and their premiership defence looking shaky. The signs were there from the start of the game. Port Adelaide looked sharp from the opening bounce and was able to work their way through the Hawthorn zone without too many dramas. They jumped out to a 20-point lead with superior ball use the key. 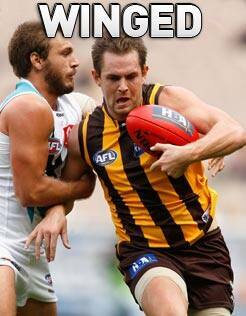 Hawthorn’s skills let them down in transition resulting in a number of turnovers, some proving costly. Their penchant for the quick, long kick inside 50 also wasn’t working although Franklin snatched back a late goal via a free kick. The Hawks did some tinkering at quarter-time and came out with a better method heading into attack. It soon translated onto the scoreboard with Franklin and Stuart Dew helping them grab the lead for the first time midway through the second term. But the Power weren’t about to be blown away. Steadying goals to Tredrea and Gray snatched back a four-point half-time lead and they headed into the rooms with plenty of belief. And that belief never wavered during the third term, despite a rising Hawks tide that saw them regain the lead twice. The star of the quarter was Tredrea whose three goals rallied his side when the Hawks pressed. At the other end Carlile worked his way on top of Franklin, while Chaplin continued his outstanding job nullifying Roughead. Hawthorn’s drive came from Jordan Lewis, Mark Williams and Brad Sewell in the midfield and a couple of moments of Cyril Rioli magic ensured the scores were level at three- quarter time. The scene was set for a ripping last quarter but it was errors that proved most critical. Two kick-in turnovers from Dew both resulted in crucial goals and gave the Power an incredible lift. After a quiet game, Brett Ebert also chipped in with a fabulous last quarter that included two goals and a couple of assists. Kane Cornes was also brilliant in completely beating Sam Mitchell. The win came from a Power side missing both Burgoynes – Shaun withdrew a knee injury and Peter was suspended – as well as captain Dom Cassisi. Hawthorn: Brent Guerra (hamstring), Travis Tuck (shoulder) replace in selected side by Beau Dowler. Port Adelaide: Shaun Burgoyne (bruised knee) replaced in selected side by David Rodan.